Do you want an air fryer that has a huge capacity and the flexibility to handle everything from fries to a turkey? Then the Big Boss fryer is a great choice for your family! It has a durable glass bowl that will outlast any Teflon-coated basket. It also comes complete with everything you need, and it is the largest capacity fryer on the market! Is this oil-less fryer the right choice for your household? It has several features that really make it stick out from the crowd. It has three heat sources that cook your food. It uses convection heat, like many air fryers, but it also has a halogen bulb and an infrared element. You get triple-power heating from this single unit. Your food cooks faster and uses less energy than a traditional oven or deep-fat fryer, and it does not heat up your kitchen! The control panel is easy to understand and use. Simply turn the top knob to select the temperature, and turn the lower knob to choose the cooking time, up to 60 minutes. There is even a handy little guide printed right on the panel for foods like chicken, fish, fries and onion rings! The unit turns itself off when the time runs out, so your food won’t burn. 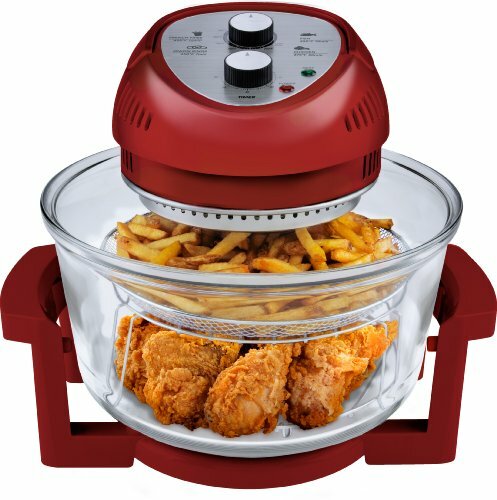 The fryer comes with a large capacity 16 quart clear bowl, allowing you to cook large items like a whole chicken or even small turkey. The glass bowl is heavy and sturdy, so you won’t have to worry about scratching or denting it, and it is easy to clean. You can even put it in the dishwasher! Depending on where you buy it, the Big Boss air fryer comes with a limited two-year warranty covering all parts of the unit from defect, including the halogen bulb and the heating elements. This does not cover damage from mishandling or dropping the unit. If you order it directly from the manufacturer’s website, however, it come with a five year warranty!! We were so surprised by this that we contacted the company to check, and they confirmed that the warranty covered the halogen bulb and all of the heating elements! Unlike many air fryers at this price point, this one comes complete with several useful accessories that make it more versatile and user-friendly. You will get two stainless steel racks for multi-level cooking and a mesh basket perfect for fries and chips. It also comes with an extender ring for cooking larger items like a whole chicken or roast. Read below for a complete list of accessories! You can color-coordinate your Big Boss oil-less fryer with your kitchen decor! Many air fryers have a few different options, but the Big Boss has the most! You can choose silver, copper, black, white, blue or red. Extremely versatile and comes with all the useful accessories in the box! Huge 16 quart capacity means you can cook more food at the same time. Glass bowl and lid allows full view of your food while cooking, and the bowl (not the lid) is dishwasher safe. At least a two-year and possibly a longer warranty on all parts against defect! Very large footprint and weight. The unit takes up a lot of room and weighs almost 15 pounds. Glass bowl is heavy and may be difficult for some to clean properly. There is a learning curve to getting the most use out of your Big Boss. You will have to play with things to find what works for you. The unit and parts get very hot while in use. Be careful or you could burn yourself! 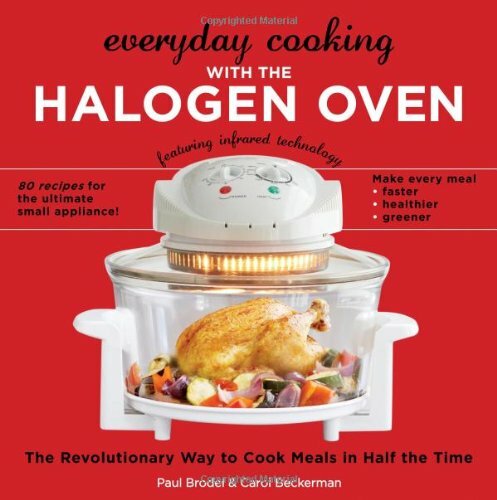 Additional cookbooks for halogen-based oil-less fryers can be purchased separately. The reviews are overwhelmingly positive. Customers note that it takes some time and practice to learn how to use it, but once you get it down it is easy and really versatile! Many reviews said that the unit has replaced their ovens and even their stove-top for things like stir-fry. 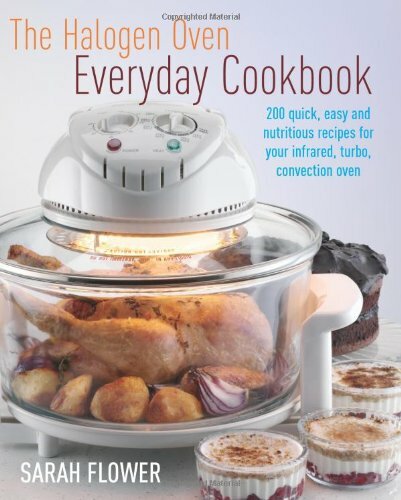 One reviewer noted that she could cook a 3-course meal for two people all in one bowl! Any appliance can have problems, and several reviewers have had units that didn’t work right out of the box. Most of the recent reviews have not had this problem, or had it quickly corrected. If you are going to use your Big Boss frequently and are buying it from Amazon, you might want to purchase the extended warranty for 2 more years of protection. A beautiful black exterior with manual controls, this fryer will fit right in on your kitchen counter. It is simple to set, with a dial for controlling temperature and another for setting the cooking time. You can fry, bake, roast and grill, all in the basket! This is a great choice for medium sized families and those who want to make several dishes at the same time. The basket and pan are even dishwasher safe! If you want a premium unit that can replace several other kitchen appliances, then this is the product for you! 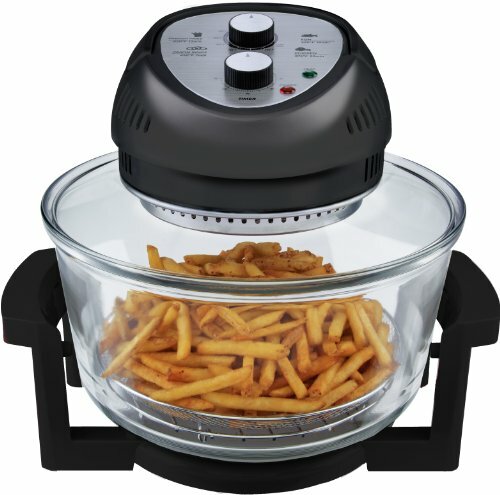 This air fryer oven can convection bake and broil, as well as airy fry and dehydrate. It has manual controls and adjustable racks so you can choose the perfect cooking position for any meal. It even has a toast selector! 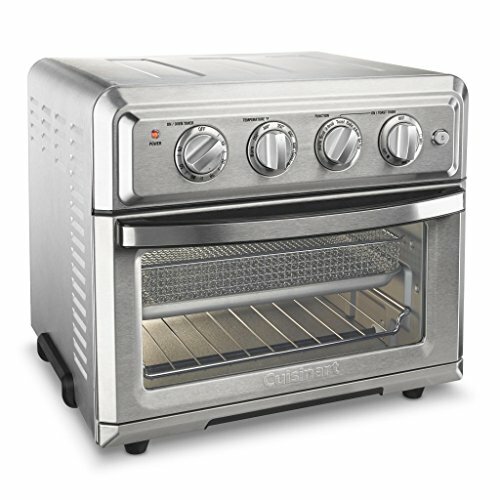 You can replace your toaster, toaster oven and air fryer with this single unit! 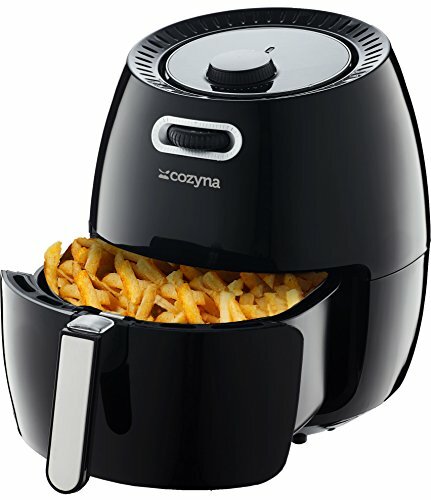 If you are looking for a huge, high capacity oil-less air fryer that can handle deep frying, baking, stir frying and more then this is a great option for you! The glass bowl is durable and easy to clean, and the unit comes complete with all the accessories you need to get busy in the kitchen! You can’t find a more versatile air fryer at this price point. Take your time to learn how to use it, and it will be your best friend in the kitchen!